Dear Friends for Life: Who are the Rohingyas? The Rohingya are a Muslim people in the Buddhist-majority countries of Myanmar and Bangladesh. Not only are they the world’s most persecuted minority group, but they are not officially recognized by governments as an ethnic minority group. For decades they have been subjected to discrimination and violence by the Buddhist majority. 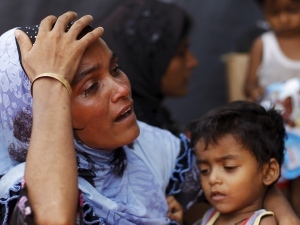 In the capital city of Sittwe in Myanmar, ethnic cleansing of the Rohingya people began in 2012. The purpose was to completely eliminate them. This new type of “genocide” is forcing thousands to flee by boat to Indonesia, and Myalaysia, only to fall into the hands of traffickers who profit from their desperation and misery. The Rohingya survivors of dangerous boat voyages from Myanmar and Bangladesh describe horrific treatment by unscrupulous traffickers of abuse and neglect. They speak of regular killings at camps, common graves and torture. Example: Hafsa, female, age 14, from Maungdaw township, Arakan State, shares the following story: My brother in Malaysia contacted a broker who found me to go to Malaysia, he said it was safer to work there. I heard the news about many people dying on the way but I cannot stay any longer in my country. I cannot get married to anyone in my village because we are poor and cannot afford to pay the officer [Burmese officials] for permission; it is about 600,000 Kyat [US$600]. I have never been to school, it is too expensive to register. The broker took me and six others by boat to the coast at night time [through the riverways]. We got on a bigger boat, there were 95 people on that boat. We spent two months on that boat, more people kept coming to the big boat, small boats all the time. We [the females] were under the boat, it was so small. I couldn’t see outside the boat, just feel it go up and down. People where throwing up, I felt dizzy and uncomfortable the whole time. I wore the same clothes the whole time, I couldn’t wash. It took ten days on the boat to get to Thailand. We were transferred to the island by small boat at nighttime, it took about one hour, we were covered the whole time. When I got to the island I thought I would die, there was no food or water. We were two days on the island. The Thai navy came and gave us food and water, took our pictures, and took us to Thailand. I just want my brother and parents to know I’m here. I cannot go home, Myanmar is not my country. The Guardian reports that heightening deprivations in Burma are driving more people into the hands of the traffickers. To solve the problem Brad Adams, HRW Asia director, concludes that Thailand, Malaysia, and Indonesia need to agree to never again engage in pushbacks of people stuck at sea, find any remaining boats, bring the people on board to safe ports, and ensure that their rights are respected. Just as important, there will be no long-term solution unless Burma ends its rights-abusing and discriminatory policies toward the Rohingya and joins other countries in taking action against smugglers and traffickers who abuse and prey on them. Catholic social teaching instructs the faithful that “Refugees and asylum seekers should be afforded protection. Those who flee wars and persecution should be protected by the global community.” We are the global community.